If you'd like to see my video review, you can see that here, or click this link to watch directly on YouTube. Read on for the full written review . . .
Edit, 01/03/2017: My wife and I have now returned the Saatva. We ended up buying the Sapira, which seems to suit us better. See that review here. I have become a mattress junkie. I have spent many hours in the last 3-4 months researching mattresses. 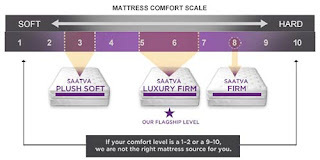 Saata is an online-only mattress company. They bill themselves as "America's Best-Priced Luxury Mattress" and "the highest reviewed mattress brand on Google" according to this YouTube video. You can also read several review for the Saatva on Amazon (though they do not actually sell through Amazon). After reading review upon review, I decided to give it a try. The 75 day in-home trial period (with a full refund if you don't like it) was the clincher for me. UPDATE, APRIL 2018: At the time of my purchase, the trial period was 75 days. Now, I see on their website that the trial period is 120 days. Saatva offers three models: "Firm," "Luxury Firm" (ie, medium-ish), and "Plush Soft." 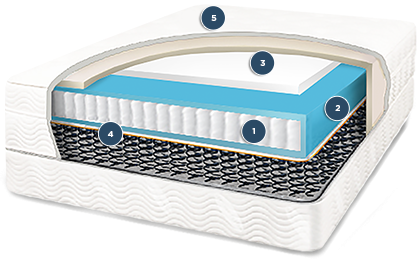 All three models are innerspring mattresses (as opposed to all-foam, latex, or hybrid). More specifically, Saatva features a coil-on-coil construction, with a Euro-top style layer on top. If you want details on the construction, Saatva has lots and lots of technical info on their site, and there is a bit more on that in my video. We settled on the queen "Firm" model which is an "8" (out of 10, where 10 is the most firm) on the firmness scale according to their web site. I feel that it's more like a 9 to 9.25. It's VERY firm. After 45 days or so, we paid the $99 shipping fee again and switched to the "Luxury Firm." Their website states it is a 5-7 on the firmness scale, but it's more like 7 to 7.5 in my judgment. We also bought the corresponding foundation (what used to be called "box springs" - very few companies actually use springs in the foundation anymore). We did not try out the "Plush Soft" model. Having tried both "firm" and "luxury firm," here are my thoughts. Of course, mattress feel and preference is such a personal thing, all I can do is give you my point of view. The Saatva mattress was certainly impressive in its construction. You can tell it is sturdy and not cheaply made. It's also made in the USA, which is a pro. It is made mostly from organic materials, if you're into that kind of thing. The top is 100% organic cotton and is well sewn. The sides were sturdy with no loose threads and elegant braiding. Running around the edge (internally) is a layer of support foam, which helps if you're sitting on the edge. I was totally satisfied with the edge support and overall sturdiness. The bottom was a quality fabric of some kind which seemed unlikely to tear. There was no noise. None. No squeaking at all. There was just a little bit of the "new mattress smell" but not much. Was not noticeable more than 2-3 days. No chemically smell. "Support" gets into tricky-to-describe territory. I don't mean that firmness equals support. (If it did, the most firm mattresses would automatically get the best grade!) By support, I mean, does the mattress hold you up OK? 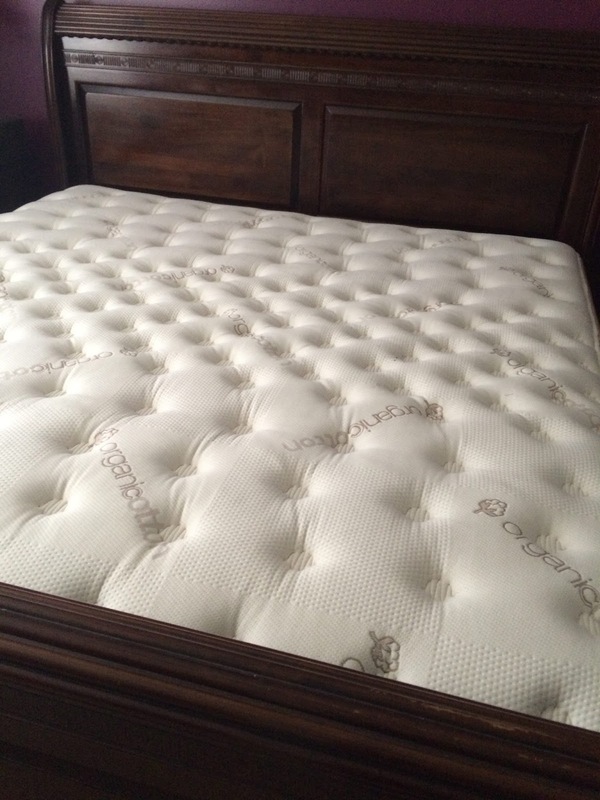 Does the firmness feel even, as opposed to lumpy or firm in spots without being firm in other spots? Although subjective, to me the support was "alright." I felt like my hindquarters and shoulder blades did sink through the top 2 inches of padding layer and engaged the pocketed coil layer in a way that wasn't great (but again, I've had much worse). This might partially be a "me" problem, as I have a fairly pronounced curve to my back. Here's where the mattress just didn't do it for me. The "firm" model was like someone laid two quilts across a board and told me to sleep on it. Can it be done? Yeah, but I didn't like it. My shoulders and hips were rather sore in the morning. Now, having said that, I need to reiterate that the grades I've given are all from my point of view. Debbi was "meh" with the "firm" model, and said that if she was sleeping alone, she could have kept it. When we tried the Luxury Firm, it was a little better, but, as I mentioned above, I felt like my hindquarters and shoulder blades did sink through the top 2 inches of padding layer and engaged the pocketed coil layer in a way that's hard to describe, but just didn't feel quite right. Things weren't great here either. What am I looking for in conformity? I want something that feels firm where it's supposed to feel firm, and soft where it's supposed to feel soft. I know that's a pipe dream (or a $5,000+ mattress), but let's at least get as close as we can. I want something that conforms to my body locally, but not globally. In other words, I want to sink into my mattress just a bit -- maybe an inch or two, but I don't want a giant valley to be formed while the mattress tries to accommodate my whole body. I also definitely don't want the 100% memory foam or Tempurpedic feel where my body is totally enveloped and I can't "escape" (I know some people like that, but not me). Can't I just get a happy medium between sinking in and floating on top? With the "firm" model, I did mostly stay in place, and sinkage didn't spread out more than 4-5 inches from my body (although the pressure point relief was so bad, this couldn't overcome it). The problem with the "Luxury Firm" was that with the slightly softer feel came more "spreading" of the sinkage my body created. The valley the bed would form to "take me in" would spread out 12 or more inches from me, and that means it would lap onto Debbi's side. This wouldn't be a big problem except we have a substantial weight disparity, so my pressure-valley was too global -- in other words, there would be a 1/2 inch to 1 inch slope where my side was generally lower than hers and she would roll into me. This caused big problems for us. This might be another "unique to us" problem. Saatva did great in this area. I called them a couple times with questions before committing to buy, and emailed as well. I communicated with them during our trial period and found them to be very responsive and they never pressured me to make any particular decision. At this point I should probably reveal that we didn't end up keeping either of the models. When we decided to return the 2nd mattress we were issued a full refund (except for shipping costs -- see below) that was applied to my credit card within 5 days. In fact, the refund arrived before they even picked up the mattress and foundation. I was asked to describe why I wanted to return the mattress, but was never pressured to change my mind. If I was evaluating them on customer service alone, I would wish there to be more companies like Saatva. I don't think it's proper to give a star-rating to shipping. I figure with any product I buy, as long as the shipping costs are stated accurately and fairly, I can't complain, because I'm smart enough to factor them into my decision. It's just something to take into consideration. We paid $99 for shipping, both for the original shipping and $99 at the time of the exchange. There was no charge for the final return, but once you begin the trial of a mattress, the shipping you paid to get it there is non-refundable. In other words, you only pay shipping when they send something new to you. I'm not excited to be out $198 in shipping expenses, but I knew about it up front, and it was a risk I was willing to take. Saatva isn't sent via UPS or Fed-Ex -- it is NOT a bed-in-a-box. Your time from order to delivery will vary as they make their mattresses to order. You will be quoted a time frame. I was quoted about 7-10 business days for both models we tried, and the actual timing was true to their estimate. They rely on local delivery companies to bring the mattress to you, so your experience may vary, but my delivery experience was fine. They called ahead and gave me a date and a 4-hour range, asked if it would work, and then stuck to it. At the time of our purchase, I paid $39 to have them remove our old mattress. UPDATE, APRIL 2018: At the time of my purchase, shipping was $99. As of now, I see on their website that shipping is now free. Just a word on the Saatva foundation. While you don't have to use a foundation at all, and aren't obligated to buy their foundation, they do have a very nice one. It's a combination of wire-frame and wood, very sturdy, and doesn't make any noise. The wire frame forms a bunch of 5-inch squares, which might actually be more sturdy than traditional slats. We got the low-profile 4.5 inch foundation, which looked perfect on our bed frame. I was originally planning to keep it, but ultimately decided to return it so that we would have the flexibility to go with whatever works best with our next mattress. It was just a hair pricey, though, at $250 (queen size). I won't give a star-rating for the foundation (since not everybody needs one), but I will give the overall score a 1/4 point bonus due to the very nice foundation. - Very well built. You can tell it is quality construction, doesn't feel flimsy at all. - Has the "innerspring feel" -- which is hard to describe, but you likely know what I mean. This is more important to some, less important to others. - Outstanding customer service. No one made me feel pressured, and when I returned it, there was also no pressure. - 75 day trial period with full refund available (minus shipping). - Consider with caution if you and your significant other have a substantial weight disparity (40+ pounds, for example). With the "Luxury Firm" especially, we felt like my body "pushed down" the Euro-top layer and made a gradual valley that my wife could feel on her side of the bed, since I am heavier. - If you have a pronounced curve in your back, you may also want to consider with caution. Comfort is a funny thing and very subjective. The top layer has a comfy feel, but doesn't react quite enough for my tastes to fill that lower and mid back area. - Moderate motion transfer (neither terrible nor great). For someone who sleeps alone, or for a couple that is within 35-40 pounds of each other, many of the concerns I expressed would not apply. Also, I'm not the (ahem . . .) most athletically built guy in the world. Someone with a more athletic build might have less reason to be concerned about what I expressed. I think Saatva would be a great choice for a lot of people, it just wasn't for us. They held up their end of the bargain and gave us a full refund during the trial period. All things considered, I would say that Saatva should be high on your list for consideration. You can use my refer-a-friend link to get a $75 gift card if considering a Saatva purchase! Click here to read Saatva's reviews on Amazon. Thanks for posting this review - I've been searching for reviews of the firm Saatva and this is the only good one I've found. Your discussion about weight discrepancy is especially helpful since there is a 88 lb weight difference between me and my husband (I'm tiny), so the firm might be best since he hates feeling like he is sinking into a mattress. Sounds like you had a good experience with the company even though the product wasn't for you, so it makes me feel more comfortable ordering untested. If you are tiny, and your husband is 88 lbs. more than you, than I would say (based on our experience) the Saatva firm would be the best of the 3. With the "Luxury firm" you will likely feel the bed sloping down to his side. If you and your husband are both into very firm mattresses, it will be great for you I think!